Winner of Healthy Recipes Contest! You are here:Home » Recipes » Winner of Healthy Recipes Contest! 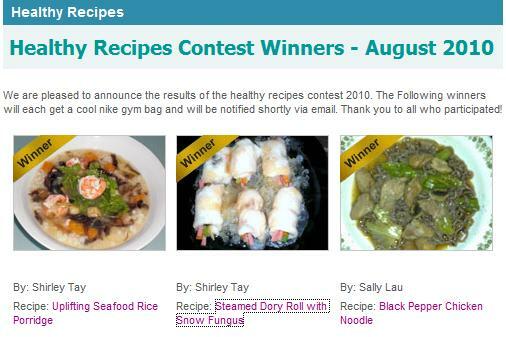 I'm pleased that not one, but two of my recipes have won the Healthy Recipes Contest organized by Health Exchange Singapore! Click on the highlighted links to start living a healthy lifestyle now! 1) Losing Appetite? Try This Uplifting Recipe! Wow, Congrats! I think there should be more than 2. ;) Your lastest steam toufu is another healthy choice. Keep it coming. Fantastic. I look forward to following your healthy kitchen exploits. Seems like you have a black belt in healthy cooking too. The Steamed Dory Rolls with Snow Fungus is brilliant. I can see a future LC deconstruction right there. I post 3 times a week normally. Tuesday, Thursday, and Saturday. I know this week's been more hectic than usual. By the way, you cannot just leave us hanging for the punchline to the joke. Even your fellow compatriot Denise doesn't know the answer. Hey congratulations, that's wonderful news. I am so happy for you daaaaaahling! Shirley, I love all your healthy dishes & those Chinese Herbal recipes! Tried a making a lot of them & my family likes it. Congrats, you deserve to win more! Thank u so much for your kind words & support! M. Spice, I noe u've been busy with the challenge. U'll have my votes! Rosidah, do drop by more often :)Thks & have a nice day! Congrats, Shirley!! So happy for you!